An inflatable hot tub is a great way to relax and unwind. However, these objects tend to be very large and bulky and placing it in the middle of your yard can be a little awkward. Because of this, it’s important to consider adding a surrounding around it. This will not only give you some privacy but will add a unique look to your yard. In this article, we’ll look at several inflatable hot tub surround ideas, and hopefully generate some inspiration. Turn your spa into an oasis with a pergola and billowing curtains, or increase the comfort with a bench resting up against the sidewall of the tub. Add a deck, or a tiered table system. Or do a combination of a variety of designs, and make your own unique inflatable hot tub surround! 3.5 Go Tiki With It! In this article, we’ll look at several ideas for inflatable hot tub surrounds. 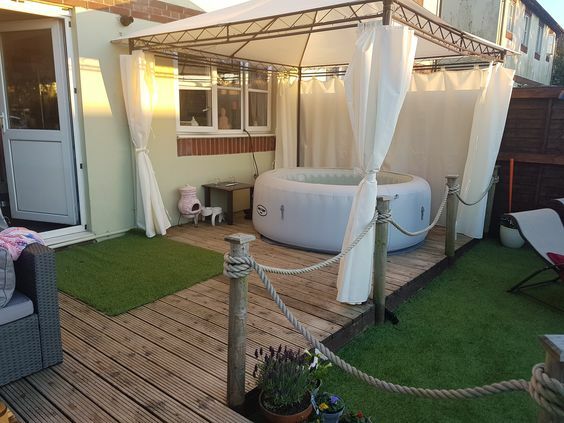 We’ll consider a few commercial options (mainly benches that rest next to the tub), and then consider a wide variety of assorted DIY or mix and match surround solutions to make your inflatable hot tub area into an oasis! We’ll start with the few commercial bench options, and then open things up to assorted designs. Most inflatable hot tubs are round. The format is a good format for inflatable tubs, and the round design helps to keep costs low. But if you want to install a surround around your hot tub, you’ve only got a few options to choose from. And to make things even more difficult, they only work with specific diameter hot tubs. Before you purchase, be sure to check the diameter of your individual hot tub. This system is made up of 5 curved pieces, from benches to planter pots to storage bins. They wrap around your hot tub and form somewhat of a circle (though they typically don’t go all the way around). This set can accommodate any spa that is between 72″ and 80″ in width. Unfortunately, it’s more expensive than most inflatable hot tubs, especially the cheap inflatable hot tubs that most buyers choose. The Festnight system is quite attractive and is positioned at a much lower price than the Canadian Spa Company system. The Inner Diameter of this system is 79.9″, so if the outer diameter of your spa is less than that, you can use it with the Festnight system. 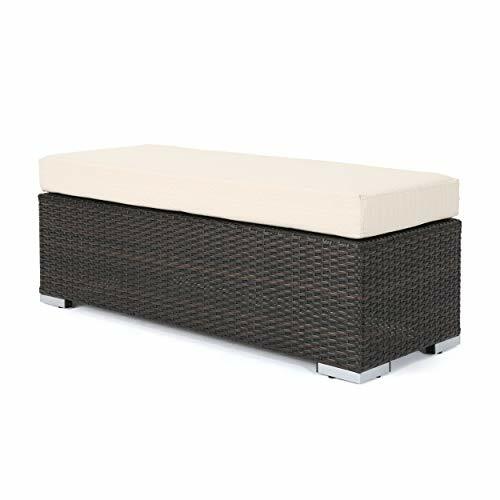 If you have an Intex PureSpa model 28403 or 28404, Intex has a great blow-up bench solution to expand your spa, improve the look, and up your style. Note: there is another version that is compatible with additional models of the Intex PureSpa (see our review here). And best of all, it’s quite inexpensive! We love Westminster Teak, they make great furniture! And these backless curved benches may work with some inflatable hot tubs, but ouch! The price is quite a bit higher than most inflatable tubs themselves! If your inflatable hot tub is square, you have a whole lot more options for surround designs. 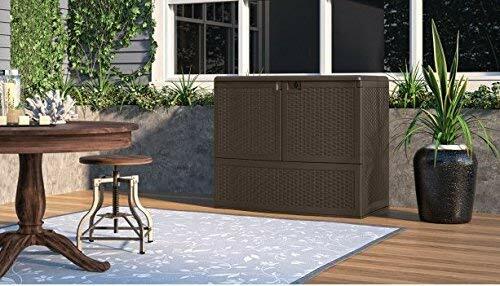 A variety of waterproof wicker-style furniture can be rested up against the straight sides of the hot tub, and the result will be an attractive surround. Here are a few ideas for furniture pieces to place against the walls of your square or rectangular inflatable hot tub. 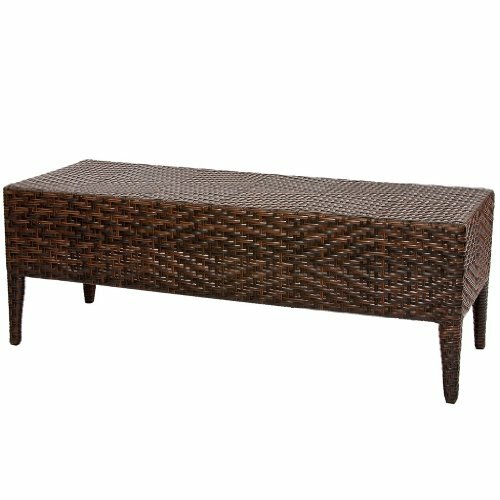 The Hobbs wicker bench is a simple brown PE-wicker bench made by Great Deal Furniture. This backless bench is not terribly expensive and will look great up against your inflatable hot tub. Height is about 17″. No need for a spa table anymore! We love this vertical deck box from Suncast. It’s beautiful, looks somewhat like a cabinet, and is quite robust. 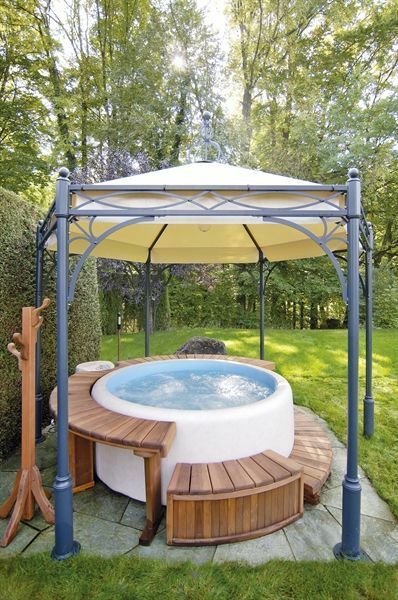 It is higher than most inflatable hot tubs, so it can function to provide privacy and utility as well. If you like the idea of a cushion, this wicker bench is an excellent choice. Similar in design to the Hobbs above, this one is a bit more modern looking, and includes a water-resistant cushion. Just beware that if you sit on the cushion just after climbing out of the tub, it may get waterlogged. Use some Spa Steps to provide easy access and egress to the inflatable hot tub. 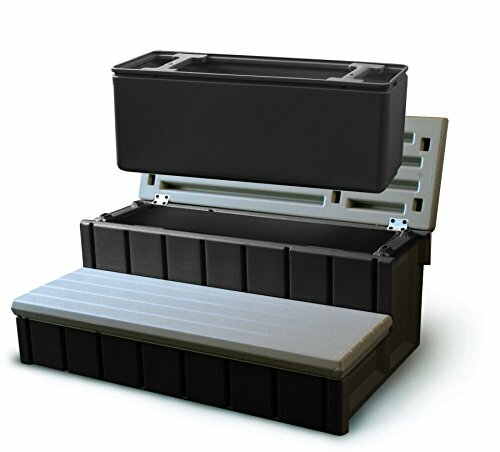 See here for information on the best hot tub steps, and find the right set for your tub. Below are some great surround ideas you can use to enclose your inflatable hot tub. These fit a variety of tastes, though many of them require a good deal of effort, and cost, to implement. Some are DIY, and some involve purchasing and implementing off-the-shelf solutions. For those who don’t mind investing a bit in a project, you can try to create a raised platform for your inflatable hot tub. This can attach to your deck or patio so it’s not situated on the ground. The raised platform will also give those in the hot tub a unique perspective as they sit back and unwind. 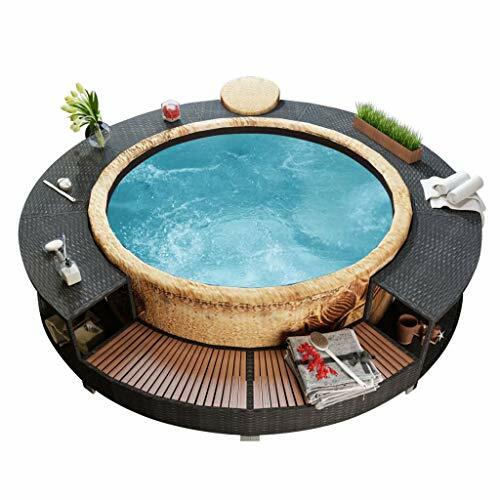 Another (although somewhat intricate) surround idea is to make a small deck to enclose your inflatable hot tub. You can place your hot tub in the middle and build a deck plan around it. You can use your imagination as to what it should look like. For instance, some have a sitting area on the other side of the deck while others build a barbeque area. You can create the perfect design for your needs so relaxing in the hot tub is even more enjoyable. While this is a luxurious option, it’s also very expensive and needs to be planned out well ahead of time. Because of this, you’ll want to carefully consider whether you want to go this route. You can create a beach to put around the perimeter of your hot tub. This way, one can sit outside of the tub if they don’t want to enter it or keep their possessions and towels on it. 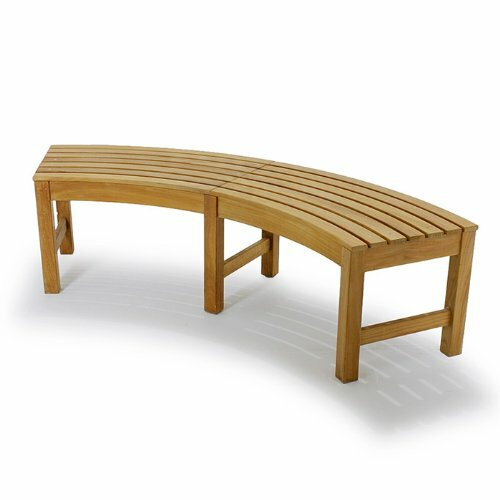 A popular material to use for benches is wood, but make sure the wood is sealed. Otherwise, this could cause it to rot or form an ugly layer of mildew. 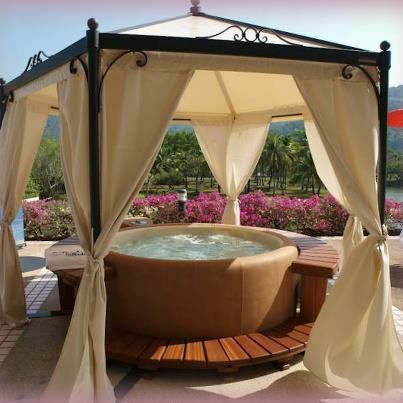 Another surround idea is to create a place a large gazebo structure around your inflatable hot tub. In this example, a soft top gazebo is used, but a hard top sun shelter solution would work as well. This can help to give you privacy but also keep any weather elements, like rain, away when you’re sitting in it. You can even fill in the edges of the gazebo with curtains and privacy panels for added elegance. This will provide even more privacy during the spring and summer and give you soothing fragrances you can enjoy while sitting in the hot tub. 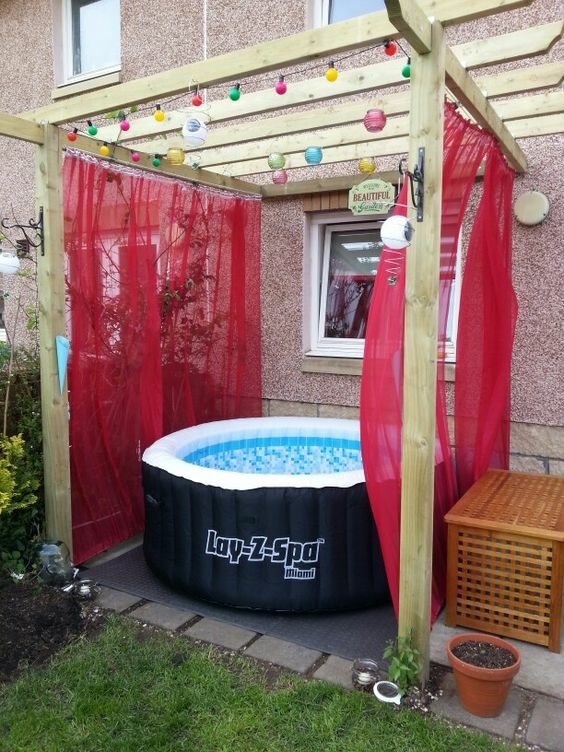 Lay-z-Spa Inflatable Surround Idea: Tiki Style! We love this one! By using some bamboo fencing, lots of plants, and a shade sail, this inflatable hot tub environment ends up with a very Tiki-style feel. A wooden pergola is similar to a gazebo, but it is built with a square shape and has a timber. You can build this structure over your hot tub and then attach some lights on the top of it to give a beautiful ambiance. 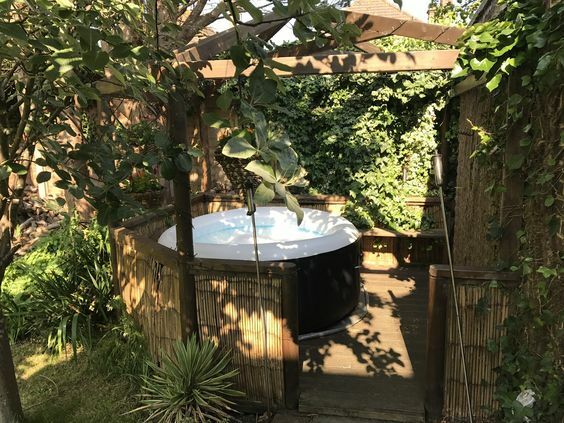 You can even have vines, like wisteria, grow over the roof to help protect the tub from the sun while also giving stunning floral views and scents guests in the hot tub can enjoy. As a note, metal pergola kits are often less expensive than wood, and work great as well! 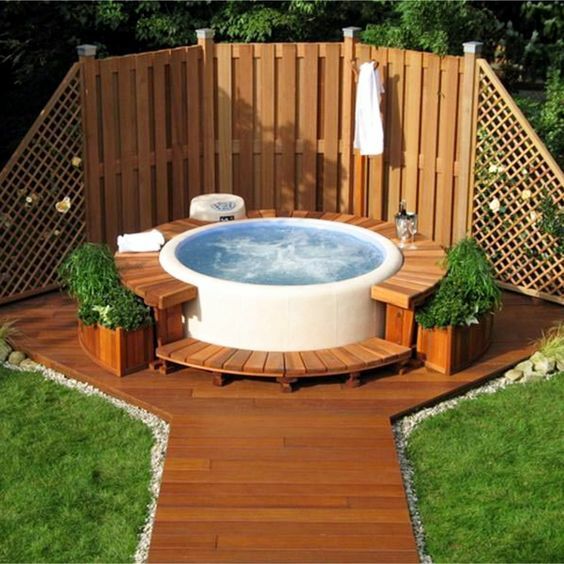 The main surround idea you can use around your inflatable hot tub is a fence. This will not only enclose the area and secure it, but give you complete privacy as well. There are numerous fence designs you can choose from so you can easily find one that matches your preferences. By using a surrounding around your inflatable hot tub, you will not only add a unique look to your yard but help to make relaxing in it more private. If you’re on the search for some surround ideas to install for your hot tub, definitely keep the ones mentioned above in mind. Still not convinced that adding some type of surrounding for your inflatable hot tub is right? Here are some benefits to them that might just change your mind. One of the best benefits of installing surroundings for your hot tub is that it can give you privacy. Sitting in a hot tub without a border can make doing so a little awkward, especially if other people can see into your yard. However, by putting plants or borders around it, you can relax in private. Consider some of the hedging plants in our patio plant guide. While hot tub surroundings promote privacy, they can also give your yard a stunning look. You can create trellises, gardens, and anything your mind can think of to put around the edges. This will help to make the area look beautiful and make the inflatable hot tub blend into your yard. Many hot tub borders are very durable which means once you build or invest in them, they’ll last you for a while. Many also are made to withstand heavy wind, rain, and snow so there’s no need to fear it being easily damaged or destroyed. Hot Tub Surrounds can really amplify the style of your inflatable hot tub and can make the whole system more comfortable and usable. However, often these surrounds are costly to purchase, and perhaps even more costly to assemble! Still, with a little effort, you can implement several of these solutions without breaking the bank.